Less than 30% of the worldwide workforce is engaged at work. That’s an awful lot of people turning up to work and not caring about their job. A concerning statistic and one that is not easily remedied. The new workforce is younger and more diverse than ever before and this represents a seismic shift in trends, aspirations and needs. Salaries and perks will always be important but the new generation of workers are looking for more than that. A better work-life balance in an increasingly digital world, a feeling that their input and ideas are valued, as well as scope to develop their own potential. In short, they are after an innovation culture. The term ‘culture’ is bandied about a lot, often positioned as a solution to the disengaged workforce. Yet it can be a bit of a fluffy term, something that everyone talks about but no one really knows what to do with. Indeed, the definition of culture that 100%Open and others use is simply, “The way we do things around here”. Creating opportunities – Firstly, employees must be given opportunities to develop their own skills and thinking, in order to create a space in which they can innovate. Stifling this potential with too much structure and an over appreciation of the status quo will be limiting, not only for the employee but also for the value they can provide to your organisation. Any talented employee with ideas, no matter their level within the company, should be heard and acknowledged. An assumption that the employees who make up the lower ranks of an organisation may not have valuable enough ideas to warrant this opportunity is naive and potentially damaging. These employees are the frontline of your business and are more in touch with the internal processes and customers than many of the senior management will be. This makes them a valuable resource and also presents an opportunity to engage with them – it’s a win-win situation. Effective leadership – Keeping employees motivated is ultimately the job of a leader. Showing genuine care and interest in the career and future endeavours of employees is key to harbouring talent. Leaders must be seen to foster this potential and provide the space for it to flourish. This includes being open to new ideas, as well as being prepared to cultivate innovation and implement the outputs. Focus on their talents and harness their best capabilities, even if it defies their job role. Trapping an employee within the boundaries of their job description is not only frustrating for them but a hindrance to an innovation culture and therefore limiting to your business. The doors must be firmly open and the boundaries broken down. Autonomy and accountability – Employees must be given the freedom to fail. This is not to say that reckless decisions should be encouraged, but innovation is about balancing risk and opportunity to grow and develop. If your organisation harbours a culture that fears failure then innovation will never thrive. Openness to change and an aptitude for smart risks are the building blocks of an innovation culture. Give employees autonomy to make their own decisions and mistakes, as well as accountability so that they can better learn from these failures. On the flip side, ensure they are just as accountable for successes and apply rewards accordingly. Employees will be more engaged when they feel a greater sense of responsibility. Sharing is caring – Sharing both struggles and successes with employees is key to maintaining innovation momentum and engagement. Employees appreciate transparency and if they have visibility over business progress, including objectives, successes and vulnerabilities, then they will feel more incentive to flourish and innovate accordingly. Furthermore, it encourages a healthy relationship between management and their staff, establishing a collaborative culture in which all levels feel comfortable sharing ideas and taking risks. This kind of supportive environment creates a healthy innovation culture in which there is significance and therefore motivation for everyone involved. 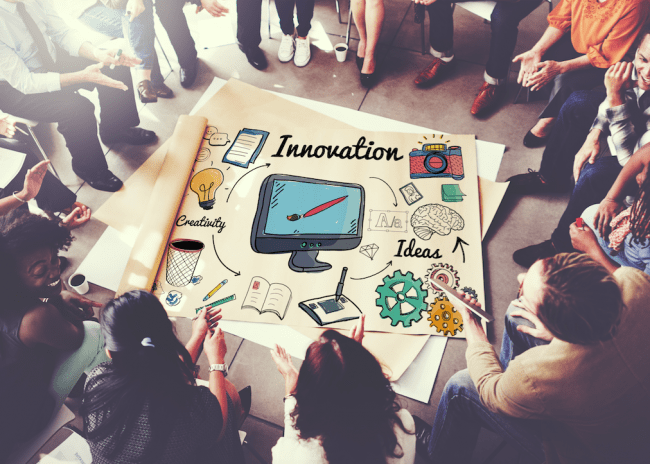 An innovation culture is not just about senior level management bandying around a few new ideas – it is about hardwiring innovation into the very foundations of the organisation, involving every single employee. Change won’t happen overnight – it takes time to build an innovation culture and onboard an entire organisation. Ultimately, for an innovation culture to truly thrive, it needs to be championed by the leaders but driven by the employees. This is a Guest Blog post by Jonny Fisher from Idea Drop who are a partner of 100%Open in the implementation and roll-out of innovation management technology platforms with a range of enterprise clients.